Looking for the definitive guide to planning your Scottish wedding? Look no further than the Spring ’19 issue of Scottish Wedding Directory magazine! Packed with ideas, inspiration and advice to help you plan your big day to perfection, this is the only magazine you need if you’re getting married in Scotland. Remember you can subscribe to Scottish Wedding Directory for a special rate of just £24 including two free gifts to add to your bridal beauty kit. Get this great rate for a limited time only. Below is a tiny glimpse of what’s in store this issue! The 10 Year Challenge. We jumped on the social media bandwagon and reflected on the big changes in the wedding world over the past decade. The results are in. From the average cost of a Scottish big day to just how much you’re spending on your wedding dress, we reveal the findings from the Scottish Wedding Census. Personal stamp. The top tips on adding a personal twist to your groomswear, whether you go bespoke, buy off-the-peg or hire. Lets party! Décor trends, theme ideas and entertainment inspo. 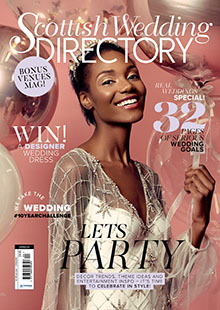 This issue, SWD show you how to celebrate your big day in style. One for the road. The ultimate guide to Scotland’s coolest wedding food and drink trucks. Scottish Wedding Venues magazine: Find your perfect venue in your supplementary copy of Scottish Wedding Venues, the only magazine in Scotland dedicated to helping you find your dream wedding venue! 50 WIN: We’ve teamed up with June Brides, Glasgow to offer one lucky reader the chance to win a stunning Eternity Bride wedding dress, worth up to £1,500.